Edison Lantigua started hitting in the second inning Wednesday night. He barely slowed down the rest of the way. 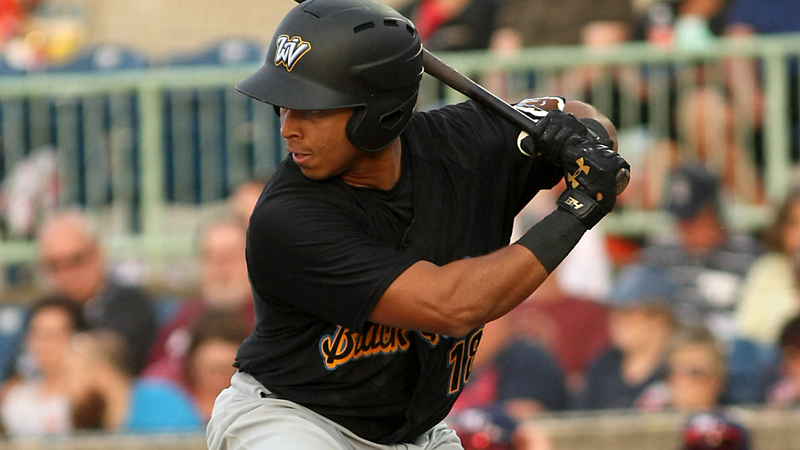 The Pittsburgh outfield prospect hit for the first cycle in the Class A Short Season Black Bears' history, posting his second career four-hit game and driving in five runs as West Virginia routed State College, 13-3. "Edison's been having a pretty good last couple of weeks, to be honest with you, and has continued to go about it the way he's been going about it," Black Bears manager Kieran Mattison said. "Tonight, he just wasn't missing balls in the zone. He was ready to hit." With the score tied, 2-2, Lantigua sparked his team in his initial trip to the plate in the second inning. The 21-year-old belted a leadoff homer to right field -- his third of the season -- to swing the lead back in West Virginia's favor for good. "It started with his first at-bat," Mattison said. "He battled and got to two strikes in his first at-bat. [State College starting pitcher Chris Holba] tried to get a fastball by him, and he just launched it over the fence. "I told the staff, that home run in the second inning, I felt like it kind of set the tone for the rest of the game. They did come back, scored two runs to tie it up in the first. It seemed like when Lantigua went out and hit the home run ... it kind of changed the momentum back to our side, and [West Virginia starter Alex Manasa] did a great job to put a zero up that next inning. Lantigua's, it was a really good at-bat. Having someone in the six-hole, the guys did a great job getting on base and he'd just drive them in." One frame later, Lantigua came through again. With two runs already home in the third, the Dominican Republic native clubbed a two-run double to center. After striking out in the fifth, he notched his single in the seventh on a grounder to right. Needing the triple for the cycle, Lantigua plated his final two runs of the game on a three-bagger to right in the ninth. "I've seen Edison grow every year," the skipper said. "My first year in the organization was 2015. I saw him when he was in the [Rookie-level Gulf Coast League], and then I was his hitting coach in '16. I saw some hitting ability in there, and he's improved in all areas. Defense, he's gotten faster, he's gotten stronger. His arm has gotten stronger. He's learned how to hit the ball over the fence. I knew he had power to the opposite side of the field when I had him in '16, and he's hitting a lot of doubles and triples. It's starting to come to fruition. He's a guy that fights in the box every at-bat." Heading into the final inning, Lantigua's final leg to the cycle seemed less likely than one for another Black Bears hitter. Designated hitter Brett Kinneman needed a single after going 3-for-5 with three extra-base hits in the game's first eight innings. "It was pretty funny," Mattison said. "When we ended the eighth inning, one of the guys said, 'We've got to bat around so Kinneman can have a chance to hit for the cycle as well.' Edison hit for the cycle, and actually Kinneman was on deck in the ninth inning. He was close to getting another shot at it, and he'd been swinging the bat well as well. The guys in the dugout, it was fun for them. I know they were paying attention. As soon as Edison hit that ball, he heard them all on the top step like, 'Go, run, run, run.' It was cool. It was cool to experience that." The four hits marked Lantigua's most in a game since tallying four for Rookie-level Bristol against Johnson City last Aug. 10, and Wednesday night extended his hitting streak to seven games. "I was telling one of our pro scouts in our organization a week ago, that's a guy that slowly but surely is putting himself on the map," the skipper said. "He's continuing to go about it the right way, and every time he's out there, he's ready to go." The feat was the first in the New York Penn-League since State College's Ryan McCarvel racked up one against Brooklyn on June 30, 2016.